Five days after Cyclone Idai made landfall in Mozambique with rain and wind speeds in excess of 150 kilometers per hour (93 miles per hour), there are still victims trapped on roofs and some communities completely engulfed by the flood waters. Food and supplies are only slowly reaching survivors as rain continues to worsen the effects of the flooding. "Many people are in desperate situations, several thousand are fighting for their lives at the moment sitting on rooftops, in trees and other elevated areas," said the UN Children's Fund (UNICEF) spokesperson Christophe Boulierac. "This includes families and obviously many children." 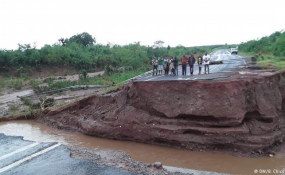 Across Mozambique, Malawi and Zimbabwe, roads, bridges and crops have been washed away. The Red Cross estimates that up to 400,000 people have lost their homes. The death toll is rising as the extent of the damage becomes known. Mozambique's President Filipe Nyusi suggested a thousand people may have lost their lives, as he announced three days of national mourning. He said his government would declare a national emergency. The Save the Children charity said of the hard-hit coastal area in Mozambique: "Aerial assessments in Sofala province, in the centre of the country, show that an area more than 50 kilometers wide has been completely submerged." On Tuesday, the World Meteorological Organization said the cyclone may be the worst weather-related disaster to have hit the southern hemisphere as the UN explained the extent of the damage and flooding: "We are talking about a massive disaster right now where hundreds of thousands — in the millions of people — (are) potentially affected," said Jens Laerke from the UN Office for the Coordination of Humanitarian Affairs (OCHA). "We need all the logistical support that we can possibly get." Some 1.7 million people were in the path of the cyclone in Mozambique, World Food Programme (WFP) spokesperson Herve Verhoosel said on Tuesday. A further 920,000 people have been affected in Malawi and "thousands more" impacted in Zimbabwe. The UN's humanitarian director Mark Lowcock said the bulk of the $20 million (€17.6) funding announced Tuesday would initially be used in Mozambique but that it was insufficient to respond to the expected increase in needs across the region. He urged donors to give generously.